What does it mean to BE A MAN OF THE CROSS? 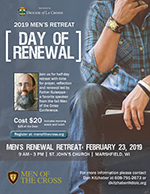 Join us for a one-day retreat that will focus on practical ways to daily live out the Gospel call be a disciple of Jesus Christ. We’ll receive great insights from Fr. Guiseppe to embrace our crosses and learn of ways to become the man, father, husband, son that God intended.